Revolax Deep with Lidocaine is a hyaluronic acid dermal filler used for the treatment of moderate to deep cutaneous depressions, including nasolabial folds, and for chin, cheek and lip enhancement. This versatile, high-viscosity injectable gel also contains a local anesthetic for the reduction of pain during treatment. Treatment with Revolax Deep with Lidocaine delivers long-lasting, natural results at affordable prices. Revolax Deep with Lidocaine is a high-viscosity skin filler that is suitable for treating many age-related concerns such as wrinkles and folds, sagging skin and facial volume loss, and can also be used for reshaping facial elements like the lips, chin and cheeks. This viscoelastic gel is made of hyaluronic acid, a substance that is naturally present in large quantities in the skin. There, it behaves as a humectant, attracting and retaining water within the skin, keeping it supple and hydrated. When Revolax Deep with Lidocaine is administered, it provides volume by occupying space within the extracellular matrix, instantly augmenting tissue and smoothing the surface of the skin. Consequently, hollows are filled, and skin depressions are improved. This dermal filler is formulated with a local anesthetic for the management of pain during the procedure. Revolax Deep with Lidocaine is manufactured by Across Corporation, a South Korean pharmaceutical company specializing in aesthetic medicine. 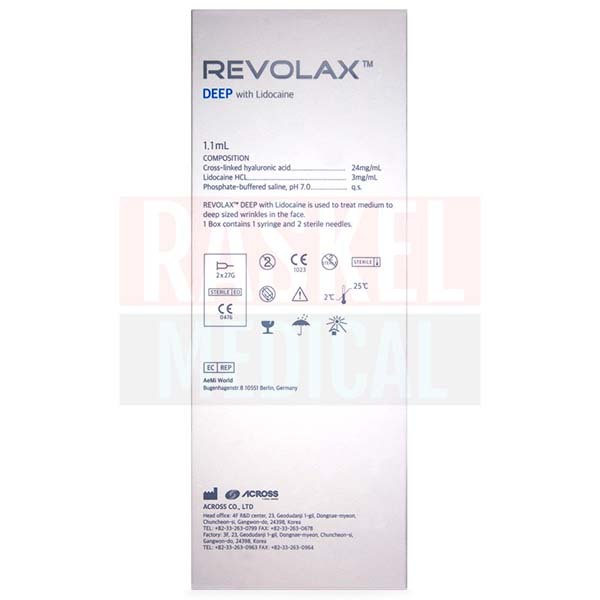 Revolax Deep with Lidocaine originates from South Korea. While dermal filler treatments are generally regarded as very safe, some categories of patients are not suitable to undergo treatment. These include patients who are known to be allergic to hyaluronic acid or lidocaine, individuals under 18 years of age, who are prone to hypertrophic scarring, and women who are pregnant or lactating. In addition, patients with active infection or inflammation in the planned treatment sites should not be treated until their condition has resolved. Finally, patients who had recently undergone abrasive dermal procedures like chemical peels, laser therapy or dermabrasion should wait before receiving dermal injections. Patients may experience temporary, mild reactions to the injection resulting in symptoms like redness, pain, tenderness and bruising at the treated site. These symptoms should dissipate within a week. Should these symptoms persist or worsen, or if new symptoms develop, the patient should seek medical attention. Revolax Deep with Lidocaine is suitable for all skin types, as it is well-tolerated and non-immunogenic. The non-animal origin of the hyaluronic acid used in Revolax products means that there is no need for allergy testing. The Revolax line of dermal fillers also include Revolax Fine with Lidocaine, a treatment targeted at fine and superficial lines, and Revolax Sub-Q with Lidocaine, for the treatment of severe and deep lines and augmentation. Administration of Revolax Deep with Lidocaine should be conducted by an appropriately qualified and trained medical practitioner. Once a treatment plan is attained and all putative injection sites are marked, proceed to disinfect the area to be treated with an antiseptic. If required, the patient may be offered additional measures for pain management (especially if treating the lips). The filler should be administered using a 27G needle into the mid- to deep dermis or subcutis, utilizing a suitable injection technique. The injection should be performed slowly whilst applying even pressure in order to avoid the occurrence of undesired events. Do not overcorrect. Thereafter, the treated area should be gently massaged, ensuring even distribution of the material. Revolax Deep with Lidocaine consists of very pure, highly-crosslinked hyaluronic acid isolated from Streptococcus zooepidemicus bacteria, provided at a concentration of 24 mg/ml. It also contains lidocaine hydrochloride at a concentration of 0.3%. It has a complex viscosity of 160 MPa. Revolax dermal injectables for the face are produced to have a uniform and homogenous structure for an ultra-smooth consistency that translates to natural looking-effects when implanted in the skin. The gel contains virtually no linear, non-crosslinked hyaluronic acid chains, further stabilizing the gel and enabling easy injection. The effects of a Revolax Deep with Lidocaine treatment are instant and relatively durable; results should last between 12 to 18 months. The longevity of treatment depends on the rate of which the filler is degraded in the body, as well as other factors like volume injected, patient skin type and area of treatment. Treatments will need to be repeated once the effects wear off, to achieve the desired results. 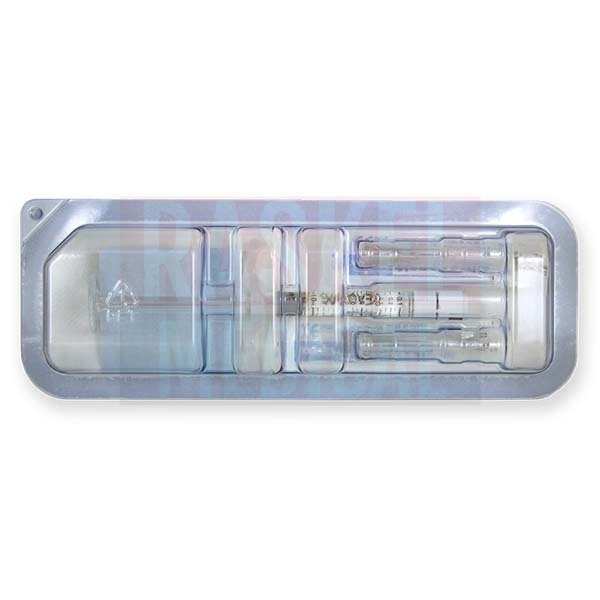 Store Revolax Deep with Lidocaine between 2–25°C. Avoid exposure to sunlight. Use this skin filler within 24 months from the date of manufacture.